No coding is required for the "Weekly & Daily Stochastics" as this indicator is built in. 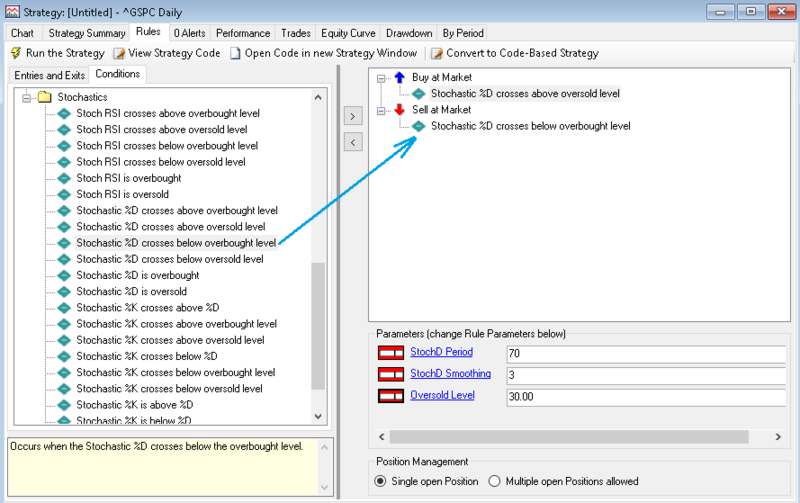 To match author's settings you should take the StochD indicator with the following parameters: period = 70, smooth = 3. It's a pleasure to show our users how to make an idea like this work with very little learning curve. Step 1. To start, either choose "New Strategy from Rules" or strike Ctrl-Shift-R. Step 2. Drag and drop an entry condition like "Buy at market". Step 3. Then swich to Conditions tab, expand the "Stochastics" group, and pick a condition. In the Parameters box, set "StochD Period" to 70 and "StochD Smoothing" to 3. By simply combining and reordering them one can come up with pretty elaborate strategies. Figure 1 illustrates the easiness – the process can take less than a minute and free you up from writing the code.